St. Patrick’s Day is one week away! I decided to change my beloved red velvet cupcakes into green velvet! I don’t have a single drop of Irish blood in me, but I always enjoy St. Patrick’s Day — I love the color green, I always support holidays that involve beer & corned beef, and it’s a sure sign that spring and warmer weather are on the way. These cupcakes taste just like regular red velvet, the only difference being the food coloring change. 1. Preheat oven to 350 degrees. Line two cupcake pans with liners. 5. Fill cupcake liners about 2/3 full. Bake for about 20-25 minutes or until a toothpick inserted comes out clean. 6. After about ten minutes, remove from pans and cool completely on a wire rack. Sift sugar and set aside. Beat cream cheese and butter on high until creamy. Add vanilla. Then, add the sugar in batches. Scrape down the sides in between each addition. Frost your cupcakes and decorate with sprinkles if you’d like. 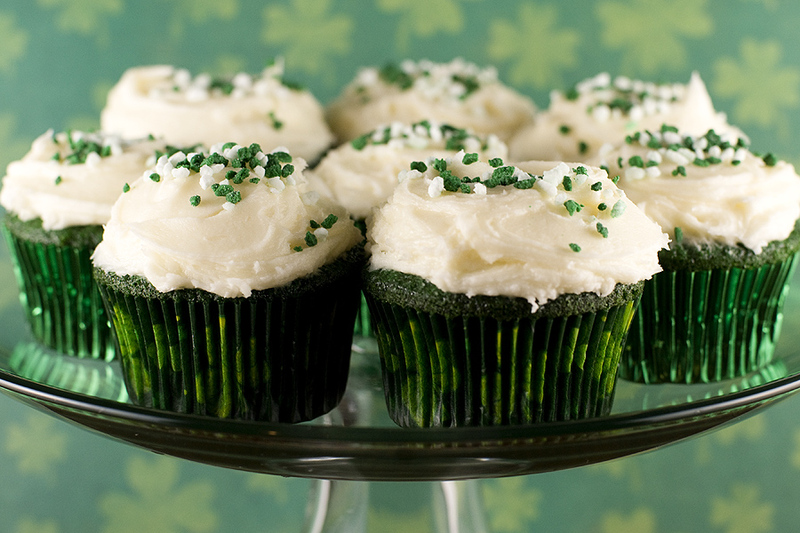 I tried these today, though they didnt get very green, I ended up dyeing the icing hah.